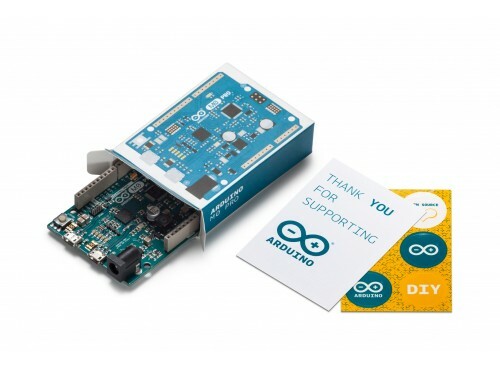 With the new Arduino M0 Pro board, the more creative individual will have the potential to create one’s most imaginative and new ideas for IoT devices, wearable technologies, high tech automation, wild robotics and other not yet thinkable adventures in the world of makers. 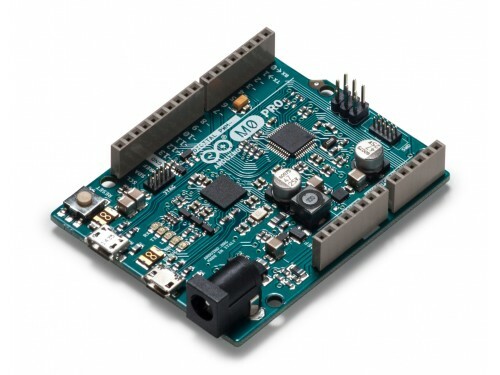 The Arduino M0 pro represents a simple, yet powerful, 32-bit extension of the Arduino UNO platform. The board is powered by Atmel’s SAMD21 MCU, featuring a 32-bit ARM Cortex® M0 core. With the addition of the M0 board, the Arduino family becomes larger with a new member providing increased performance. 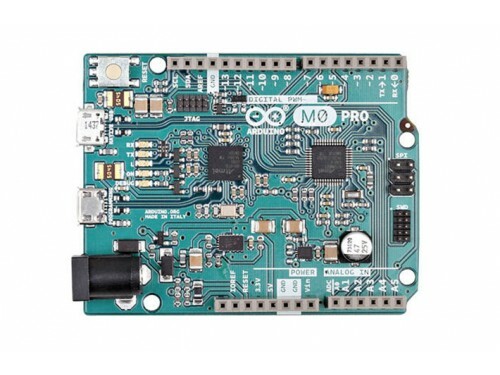 The power of its Atmel’s core gives this board an upgraded flexibility and boosts the scope of projects one can think of and make; moreover, it makes the M0 Pro the ideal educational tool for learning about 32-bit application development. Atmel’s Embedded Debugger (EDBG), integrated in the board, provides a full debug interface with no need for additional hardware, making debugging much easier. EDBG additionally supports a virtual COM port for device programming and traditional Arduino boot loader functionality uses. You can find in the Getting Started section all the information you need to configure your board, use the Arduino Software (IDE), and start tinker with coding and electronics..
VIN. The input voltage to the Arduino board when it's using an external power source (as opposed to 5 volts from the USB connection or other regulated power source). You can supply voltage through this pin, or, if supplying voltage via the power jack, access it through this pin. The allowed input voltage range for this pin is 6-20 V.
5V. The regulated power supply used to power the microcontroller and other components on the board. This can come either from VIN via an on-board regulator, or be supplied by USB or another regulated 5V supply. The maximum current output provided by the on.board regulator is 1A (according to the power input source). 3V3. A 3.3 volt supply generated by the on-board regulator. Maximum current draw is 1 A (according to the power input source). IOREF. The voltage at which the i/o pins of the board are operating (i.e. VCC for the board). This is 3.3V on the M0 Pro. Serial: 0 (RX) and 1 (TX). Used to receive (RX) and transmit (TX) TTL serial data using the ATSAMD21G18 hardware serial capability. Note that on the M0 Pro, the Serial class refers to USB (CDC) communication; for 3v3 level serial on pins 0 and 1, use the Serial5 class. SPI: on the ICSP header. These pins support SPI communication using the SPI library. Note that the SPI pins are not connected to any of the digital I/O pins as they are on the Uno, They are only available on the ICSP connector. This means that if you have a shield that uses SPI, but does NOT have a 6-pin ICSP connector that connects to the M0 Pro's 6-pin ICSP header, the shield will not work. Analog Inputs: A0-A5. The M0 Pro has 6 analog inputs, labeled A0 through A5. Pins A0-A5 appear in the same locations as on the Uno; Each analog input provides 12 bits of resolution (i.e. 4096 different values). By default the analog inputs measure from ground to 3.3 volts, though is it possible to change the upper end of their range using the AREF pin and the analogReference() function. 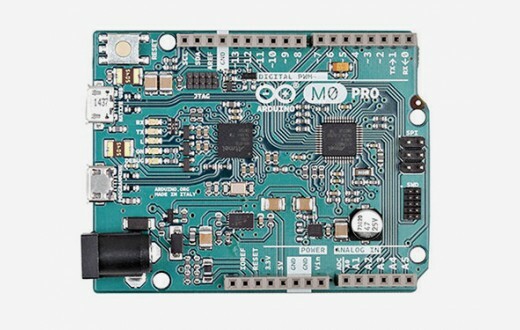 The Arduino M0 Pro has a number of facilities for communicating with a computer, with another Arduino or other microcontrollers, and with different devices like phones, tablets, cameras and so on. The SAMD21 provides one hardware UART and three hardware USARTs (3.3V) for serial communication. The Programming port is connected to EDBG, which provides a virtual COM port to software on a connected computer (To recognize the device, Windows machines will need a .inf file, but OSX and Linux machines will recognize the board as a COM port automatically.). The EDBG is also connected to the SAMD21 hardware UART. The Serial on pins RX0 and TX0 provides Serial-to-USB communication for programming the board through the ATSAMD21G18microcontroller. The Arduino software includes a serial monitor allowing simple textual data to be sent to and from the board. The RX and TX LEDs on the board will flash when data is being transmitted via the ATSAMD21G18 chip and USB connection to the computer (but not for serial communication on pins 0 and 1). The Native USB port is connected to the SAMD21. It allows for serial (CDC) communication over USB. This provides a serial connection to the Serial Monitor or other applications on your computer. The SAMD21 also supports TWI and SPI communication. The Arduino software includes a Wire library to simplify use of the TWI bus. For SPI communication, you can use the SPI library. 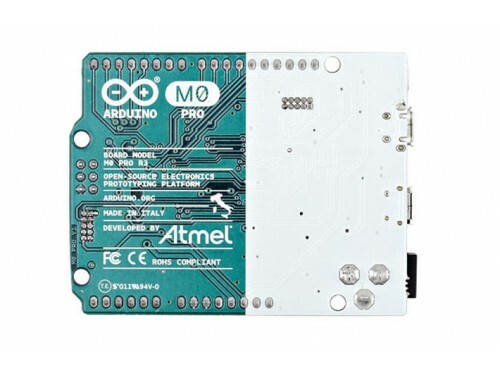 The Arduino M0 Pro can be programmed with the Arduino software (download). If you use Linux-based OS follow the guide Arduino IDE on Linux-based OS. Uploading sketches to the SAMD21 is different from how it works with the AVR microcontrollers found in other Arduino boards: the flash memory needs to be erased before being re-programmed. Upload to the chip is managed by a dedicated ROM area on the SAMD21. Both the USB ports can be used to program the board. Programming port: To use this port, select "Arduino M0 Pro (Programming Port)" as your board in the Arduino IDE. Connect the M0 Pro programming port (the one closest to the DC power jack) to your computer. The programming port uses the EDBG as a USB-to-serial chip connected to the first UART of the SAMD21 (RX0 and TX0). The EDBG has two pins connected to the Reset and Erase pins of the SAMD21. Opening and closing the Programming port connected at 1200bps triggers a “hard erase” procedure of the SAMD21 chip, activating the Erase and Reset pins on the SAMD21 before communicating with the UART. This is the recommended port for programming the M0 Pro. It is more reliable than the "soft erase" that occurs on the Native port, and it should work even if the main MCU has crashed. Native port: To use this port, select "Arduino M0 Pro (Native USB Port)" as your board in the Arduino IDE. The Native USB port is connected directly to the SAMD21. Connect the M0 Pro Native USB port (the one closest to the reset button) to your computer. Opening and closing the Native port at 1200bps triggers a 'soft erase' procedure: the flash memory is erased and the board is restarted with the bootloader. Opening and closing the native port at a different baudrate will not reset the SAMD21. The M0 Pro has a resettable polyfuse that protects your computer's USB ports from shorts and overcurrent. Although most computers provide their own internal protection, the fuse provides an extra layer of protection. If more than 500 mA flows through the USB port, the fuse will automatically break the connection until the short or overload is removed. The maximum length and width of the M0 Pro PCB are 2.7 and 2.1 inches respectively, with the USB connector and power jack extending beyond the former dimension. Four screw holes allow the board to be attached to a surface or case. Note that the distance between digital pins 7 and 8 is 160 mil (0.16"), not an even multiple of the 100 mil spacing of the other pins.